All works of art embody their histories, in what they depict, the way they were made, how they’ve been used, or the hands through which they’ve passed. In the category of Chinese Export Art, this is true on nearly every count. Each piece affirms a history and a pattern of collecting that foreshadow the dynamic, global nature of art, design, and connoisseurship today. 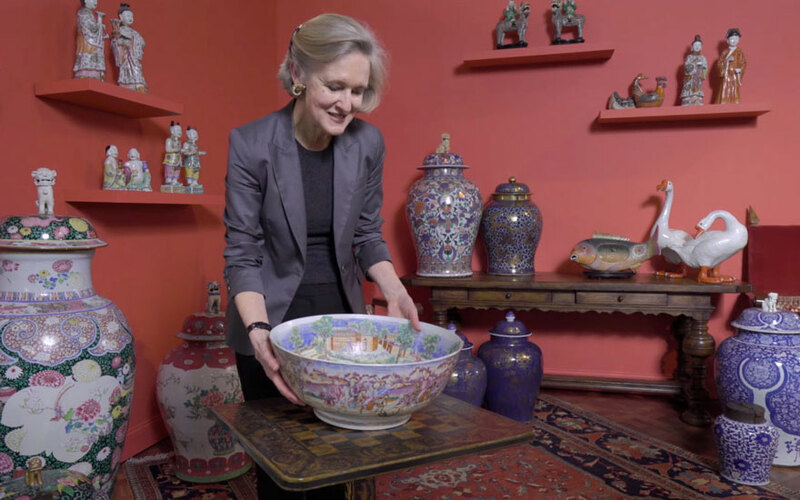 Europeans were astounded by Chinese porcelain, and it became a coveted luxury item. Chinese porcelain first appeared on the market as early as the 14th century, MacGuire says, then increasingly in the 15th, 16th and 17th centuries as navigation improved, trade with China accelerated, and Europeans sailed to Asia ‘with the purpose of bringing back shiploads of Chinese goods’. The nature of the artworks and objects they brought back shifted over the course of these centuries, too, as Chinese craftsmen sought to capitalise on this new interest in their work, and European companies and connoisseurs realised they could commission pieces that aligned with their own tastes. What resulted was a fascinating synthesis of East and West. The Tibor Collection has strengths in nearly every category of Chinese Export porcelain, from armorial motifs to famille rose and famille verte patterning, to whimsical serving vessels and figures. Yet it takes its title from its particular strength in extra-large, richly decorated vases — called tibores by their Hispanic buyers and admirers. The term also speaks to the Latin origins of this collection, which was amassed over some 40 years. Not only is it strong in Chinese Export porcelain that was made at the very height of the China Trade Period, it’s also strong in work that was made specifically for those who were living and thriving in Spain and the Spanish territories in North and Central America, then referred to as ‘New Spain’. Hispanic tastes in this material tended towards the big, the bold and the colourful, as evidenced throughout the Tibor Collection. Highlights include 5ft-high ‘soldier vases’ lavishly enamelled with images of exotic flora and auspicious carp; cranes and roosters sculpted masterfully from talon to beak; tibores made for chocolate; tibores made for decoration; tibores made for royalty, too — select soldier vases in the collection were originally commissioned for King Philip V of Spain. The Tibor Collection is rich in fantastical tableware as well — things for serving, things for show, and, most dramatically, a series of bird and fish tureens that puffed out steam when put to use. Yet it’s a subtler piece that might, in itself, convey much of this history in capsule form: a rare punchbowl from the Qianlong period, circa 1785. ‘On the outside we have a Chinese tiger hunt,’ MacGuire says, ‘with some hunters on horseback, others spearing this poor tiger that’s just met his fate. And on the inside we have a European fox hunt.